What is Party on the Patio Spring Fling? 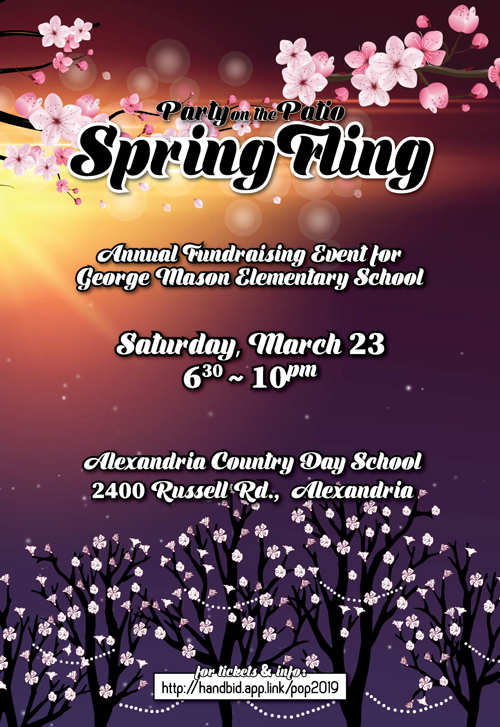 This annual social fun event is the largest fundraiser of the year for the George Mason Elementary School PTA. Approximately 35% of the PTA budget is raised in the one night. The event includes the party, both a live and silent auction, and a raffle. Is there food and drink provided? Wine and beer is donated for the event. To help make our evening a success we ask for help with food from our George Mason Community! Food for our event is provided on a Potluck style basis. As we get closer to March 23rd, be on the lookout for a food sign-up link where individual families can sign-up to bring a dish to share with everyone at the event. Also, can you please add the sign up genius link for food donations and volunteering? Do I need anything special to attend? Ticket sales, raffle tickets, and silent auction items are done in the app Handbid. Download in your app store and search for Party on the Patio 2019. Once you’re registered you can buy your tickets and start bidding! Do I have to attend to bid on items? Glad you asked! You do not have to be present to bid on the silent auction items, but you do have to attend for the raffle items, live auction items, and sign on parties. What is a sign on party? Sign on parties are unique, often themed, gatherings where George Mason families can mingle and have lots of fun! All parties are donated and hosted by George Mason families and friends. Depending on the party, they’re either first come, first serve (like Argyle movie night and shopping parties) or bid up (like Halloween on Davis and Single Malt Scotch Tasting). Bid up parties have a minimum starting bid, but the highest bids (the number of spaces varies by party) are the only ones that win the spot at the party. This year we are doing a reverse auction for the two most competitive sign on parties, Ridge Rd Oktoberfest and Fire by Fontaine. While there isn’t a formal dress code, most attendees are upscale casual. Think date night dinner with a spring flair. Can I donate to the auction? Absolutely! If you have an item to donate or have a suggestion, please contact Jessica O’Neil at joneiljmu@gmail.com. My business might be interested in sponsoring, who do I talk to? We’d love to discuss sponsorship opportunities. Please email Alicia Rutherford at Alicia.g.rutherford@gmail.com for more information. Please feel free to contact Alicia Rutherford at Alicia.g.rutherford@gmail.com with any additional questions.